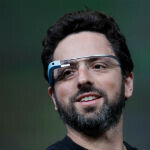 Sergey Brin says "The cell phone is a nervous habit"
Sergey Brin has been one of the driving forces behind many Google products. Where Larry Page was always expected to become the CEO of Google, Sergey always planned to stay engaged in products. This is one reason why we've seen Sergey wearing Google Glass almost nonstop for the past year, and today Sergey explained why he is so passionate about Glass, even going so far as to say that "the cell phone is a nervous habit". We often question if this is the way you want to connect with the people in your life. I feel it's kind of emasculating. You're just rubbing this featureless piece of glass. Brin went on to say that his wife still uses a BlackBerry exactly because it isn't "featureless" and at least offers some sort of tactile feedback. He went on to say, "The cell phone is a nervous habit. I whip this out and look as if I have something important to do. [Google Glass] takes that away." We have to agree with this estimation, because we have certainly felt the pull of that "nervous habit". It's a common argument against the way we use our smartphones that they tend to distance us from real experiences. We don't see concerts anymore, we just see the video of it that we're recording on our phones. We don't connect in real life, only on social networks. We have confidence that Google Glass could help to lessen the "nervous habit" and maybe bring people back to the real world, but there were shy people before smartphones and there will be shy people as we go forward. So, we don't expect that much of a social revolution once we're pulled back from our phones. I disagree. When my family and friends are talking, we take out a phone only to show "Hey look at this!" the conversation and communication is still face to face. Yes we text more than talk on the phone, but more than anything I prefer to go visit a friend and be in the same room. I totally agree with Sergey.. thanks for this article, no trolls. edit: "all technology will lead to the decline of IRL social interaction". technology boosts overall social interaction quite a lot. just because you're not face to face with the person doesn't mean you aren't interacting. If Google Glass came with that clear (see through) material, then i would consider buying this product... The colourful ones are nice looking too, but i don't like having a blind spot by my eye. But $1,500? I'm quite sure that he appreciates it, but I think his point is that while it is the best we've got so far, it's not the best we can do. From everything I've read about Sergey, he's one of those guys that doesn't accept any downsides. No matter how good something is, if there's a downside, it's not good enough. People were weirded out when Bluetooth headsets first came out and people seemed to be talking to nobody, but that's become normal. I doubt giving commands will come off that strange. I think Google is working really hard to make them look like something someone would want to wear. I definitely believe the rumors about Warby Parker. Glass seems like one of those things that people will be wary of at first, but once you try it (assuming the price isn't too crazy), people will jump on board. There is much truth to his statement. People have started to rely too much on facebooking each other rather than having a real conversation. Are conversations via FB chat not "real conversations"? Oh no you can easily have a real conversation through FB. We are having a conversation right though I have never met you because of such technologies like that. However, when talking online because the substitute that people prefer versus talking and interacting face to face, it becomes a problem. If you consider the technology like Google Hangouts and Skype, allowing people to interact and merge ideas together no matter where they are (assuming they have internet) its amazing the level of collaboration we are capable of today. I just think that we should never forget to interact face to face as I have seen people communicate with each other through their phones even though they are standing right next to each other. Google Glass even though it still connects you to the online world can still give you exactly what feels right, human interaction.